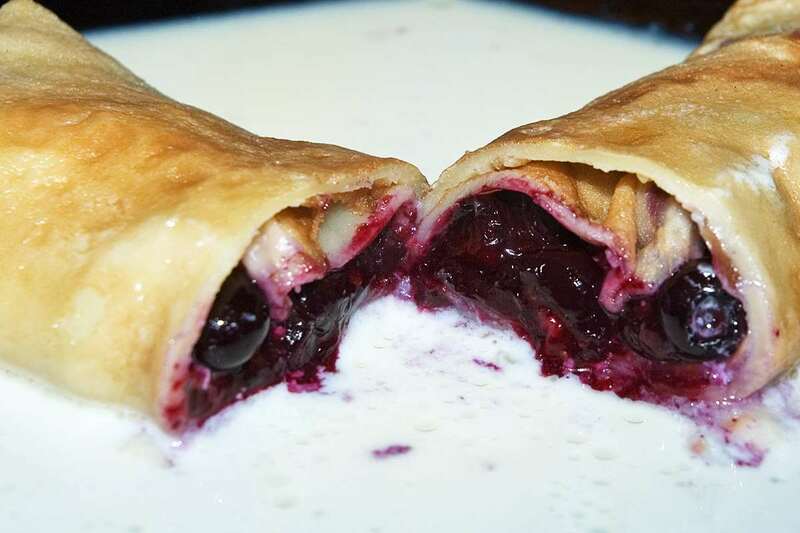 A nice dessert that can be prepared in advance and just finished in the oven: Pancakes filled with blueberries, served warm with a light cinnamon-vanilla sauce. Combine blueberries with sugar and brandy. Let sit for at least a few hours (better overnight). Combine flour, eggs, vegetable oil and salt. Whisk just until smooth. Whisk in milk. Cover and let rest for at least 30 minutes. Set pan over medium-high heat (I usually use my nonstick pan). Brush with butter. Add pancake batter (1/3 cup / 80ml per pancake). Tilt pan in all directions to distribute the batter evenly. Bake until golden brown, than turn and finish other side. Remove from pan and set aside. Repeat, you should have at least 6 pancakes. In a saucepan combine milk, cream, vanilla extract, sugar and salt. Add cinnamon stick. Set over medium heat and bring to a boil. Reduce heat and simmer for ca. 10 minutes. Remove from stove, remove cinnamon stick. Whisk in butter. Note: The sauce doesn't need to be thickened. Lightly grease a ceramic form with butter. Fill the pancakes: Placing some blueberries on them and roll them up. You should fill at least 6 pancakes. Pour about one third of the vanilla sauce over the pancakes. Distribute the remaining vanilla sauce over plates. Place a pancake on each plate. Serve warm.